It’s March and that means it’s time to celebrate the Irish in all of us ahead of St. Patrick’s Day. This month, we’re dressing up a fine whiskey with a little extra flavor. Our featured drink this month, The Five Points, features Tullamore Dew 12 year Irish Whiskey, a delicious spirit that is great straight up or mixed. 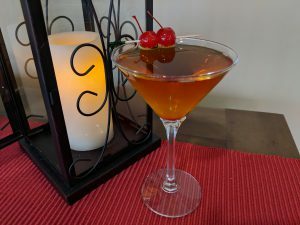 Stop in this month to warm up with our featured cocktail!